Finally, dual 2560×1440 displays on my Razer Blade, without resorting to forcing the HDMI connection into a resolution it really doesn’t want to support. 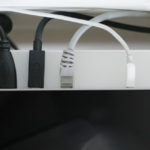 In the process of testing the OWC Thunderbolt 3 dock – review currently in progress – I noticed that it sported a mini DisplayPort 1.2 connector in lieu of multiple different video outputs. A quick research of the implications of DisplayPort 1.2 (the version that’s available over Thunderbolt 3) lead me to discover Multi-stream Transport. After a bit of a rant about all this USB Type-C/Thunderbolt 3 video out nonsense the air is clear, and I’m ready to extol the virtues of this little hub, particularly with respect to the Razer Blade. 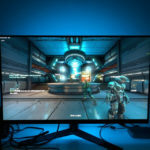 Multi-stream Transport, the technology that allows such wonders as daisy-chainable monitors, is a way of stuffing the signals for multiple displays down the single DisplayPort connection. DisplayPort 1.2s bandwidth is pretty immense, supporting up to 3840×2160 pixels at 60fps, and 1.3 even more. Clearly somewhere in the design process someone thought “Hey, what if people want to use that bandwidth for four low resolution displays instead?” and MST was born. This is great for the Razer Blade, because it’s impossible to get multiple displays connected via USB Type-C or Thunderbolt 3 without it. Why? 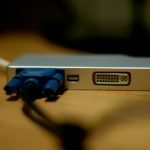 Most Thunderbolt 3 to Dual DisplayPort adaptors will rely on the fact that Thunderbolt 3 is cable of carrying *two* separate DisplayPort 1.2 signals. This is fine; in many cases that’s true, such as the Dell XPS13 and MacBook Pro. Unfortunately, the Razer Blade differs; for technical reasons there is just a single DisplayPort 1.2 signal routed from the Intel Graphics to the Thunderbolt 3 controller. This means no matter how hard you wish, the second DisplayPort output on the adaptor will just do nothing. With only one DisplayPort signal to route, the second port might as well be unconnected for all the good it’ll do you. 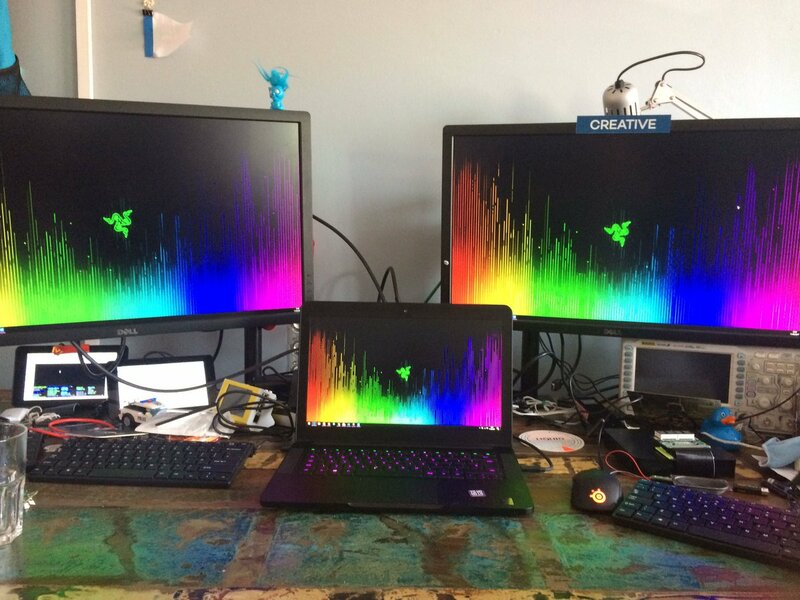 When the bombshell of tricky multi-monitor support first landed for the new Razer Blade systems, savvy users quickly found that daisy-chaining multiple displays worked in some cases, but not all. The idea of using an MST hub was also quickly suggested. Multi-stream transport is a tricky beast, but if you can find a solution that works for you, it’s a godsend for Blade users. 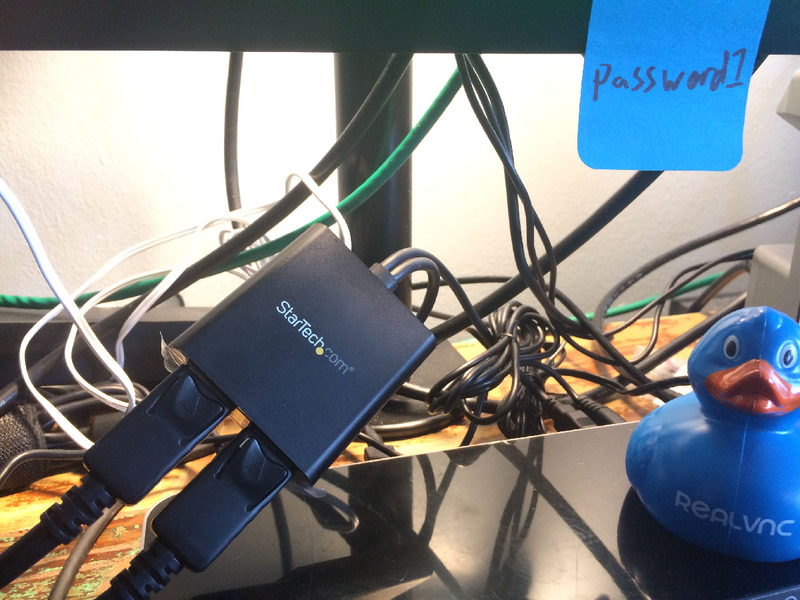 I found my solution in StarTech’s “Mini DisplayPort to DisplayPort Multi-Monitor Splitter – 2-Port MST Hub” or MSTMDP122DP for short (fun game: try to guess StarTech product codes from the feature set :D), which StarTech were kind enough to send for testing. It’s not ideal for the average Razer Blade user since I’m using it with a dock that provides the mini DisplayPort connection it needs, but a USB Type-C version is available. This combination of DisplayPort MST hub and Thunderbolt 3 Dock gives me a convenient one cable docking solution for my Blade (well, two if you count the power since the Blade is a hungry, hungry beast). In no uncertain terms I was ecstatic when it worked. I’ve been driving one of my displays from the HDMI port on my Blade on and off for a while, but it’s always been a hassle to plug in/unplug every day and will only run at 30hz due to limited HDMI bandwidth. It also only worked at higher than 1080p with a custom resolution set up in much the same way as I had to wrangle my Intel NUC. Since this is supposed to be a review of the StarTech MST Hub, I figured I should probably talk specifically about it. The Hub comes in StarTech’s typical white and yellow, eminently recyclable cardboard packaging complete with an exhaustively long product name and brief description of what it does. Inside the box the hub is nestled in a cardboard insert, and its two connection cables: USB and DisplayPort are tucked away behind it. A paper getting-started guide is tucked underneath. You MST hub is also available in a USB Type-C format, with the signal and power running over the same cable. There are also a slew of other MST hubs from StarTech with 2, 3 and even 4 DisplayPort connections on them for various monitor configurations. Unlike some other StarTech adaptors, in lieu of extruded aluminium the MST hub has a matte black plastic case which mimics anodised aluminium pretty well. In fact I’m still not entirely sure that it’s not aluminium. 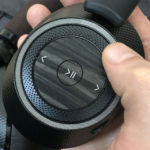 Either way, I really love the black and it looks premium. More so, in fact, than the silver aluminium finish. It also very, very closely matches the black of my laptop (you can have different shades and textures of black, I swear!) which is a bonus. Cable management is a lost cause on this desk. There’s nothing much to the MST hub. Two full-sized female DisplayPort connectors occupy the front, the USB and DisplayPort cable pop out the back, and a small button marked “SCAN” (which I’ve so far not needed to press) is situated on the back and to one side. 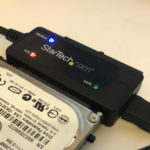 The USB connection is there exclusively to provide power and the mini DisplayPort connector for plugging into your computer or dock. I can’t find any reference to this “SCAN” button in either the in-the-box documentation or the online manual. What is this mystery button!? Pressing it triggers a re-detect of all displays, causing windows to pop up another “DisplayPort Topology” notification, so presumably it’s for prodding troublesome monitors that don’t detect when you plug them in. 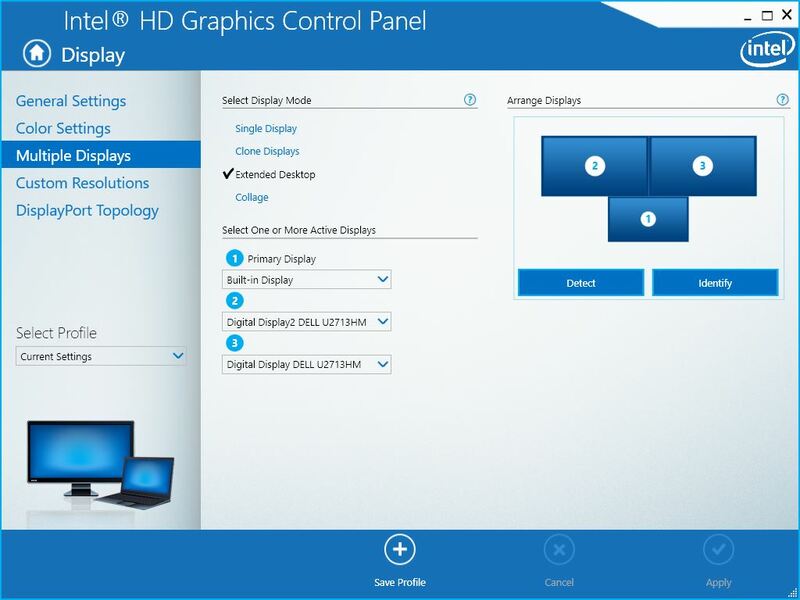 The hub doesn’t require any driver installation, since MST is a standard feature of DisplayPort. To set it up I did nothing but plug it in, connect the first DisplayPort monitor, cross my fingers, and connect the second. 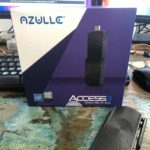 This worked with both my Razer Blade laptop, and with my Intel NUC which also has a mini DisplayPort connector. It’s actually an extremely useful accessory with the NUC. Where previously I was using the HDMI connector (many systems ship with one HDMI and one DisplayPort because the latter is still incredibly popular) and a custom resolution to get a sub-par 2560x1440x30 (these Dell U2713HM do not welcome their native resolution over HDMI) now I can just plug both U2713HM displays right into the MST hub and they just work. No setup or fiddling was required in either Windows 10 or, surprisingly, Ubuntu 17.04. Granted in both cases I realised I’d connected the monitors in reverse and had to quickly flip them in software. There’s a distinct 1 and 2 port but they aren’t labelled as such on the hub, presumably 1 is on the left and 2 on the right. Using only two displays, I didn’t have to tweak anything here. 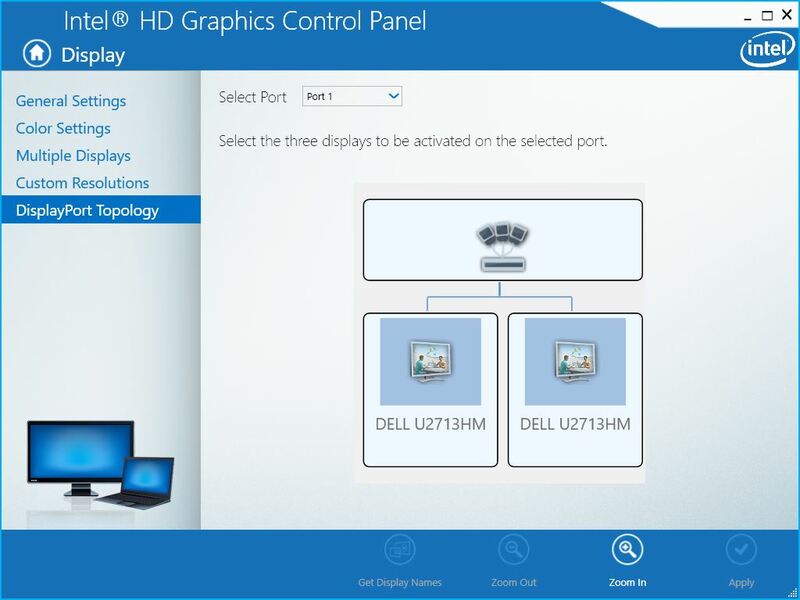 Over on the Multiple Displays pane, the two connected U2713HM monitors showed up as display 2 and 3 (1 being the built-in display) and were indistinguishable from displays connected directly to a DisplayPort or HDMI connector. It’s also possible to adapt the DisplayPort outputs on the MST hub to DVI or HDMI as you see fit, but I could dig up neither cables nor adaptors to actually put this to the test. 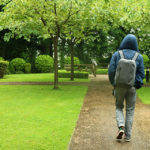 I will update this article if I manage to do so. Apparently MST can sometimes be a tricky beast, but my experience of it has been absolutely flawless. The technology works as if the two DisplayPort connectors exposed by the StarTech MST hub were just built right into my laptop. The same can be said for the Intel NUC, which worked with the two U2713HM displays without a hassle. 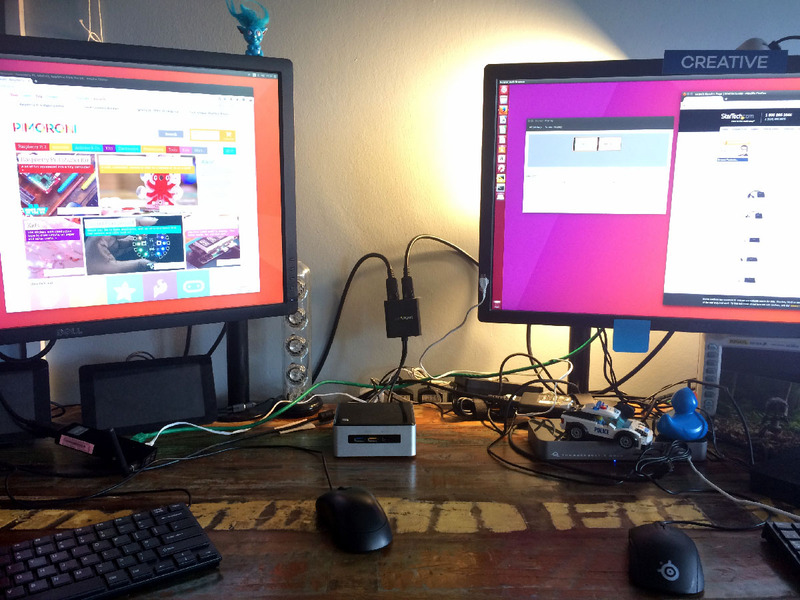 With this kit I get two displays on top of my built-in 1080p display, and the ability to hot-plug both the dual displays, plus my USB mouse and any connected USB peripherals, speakers and headphones with one single solitary cable. That’s pretty cool, and is closing on the ideal one-cable docking setup I’d love, but unfortunately can’t have with such a power hungry laptop. On to of this my built-in HDMI port still works, allowing me the option of a third external display. As this is the first adaptor I’ve tried that lets me get two displays hooked up to my Razer Blade without fuss or bother I’m somewhat biased toward saying it’s the best thing since sliced bread. 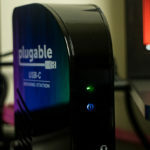 Multi-stream Transport can have its quirks and peculiarities, but so far it’s proven a fantastic way to get hassle free signals out of two of my computers- allowing me to either ignore the HDMI connection altogether, or leverage it for a third or fourth monitor (I gave a 5″ 800×480 one that’s fun to hook up). It took no extra setup or fiddling and was just plug or play on Ubuntu 17.04 and Windows 10, which is a bonus. 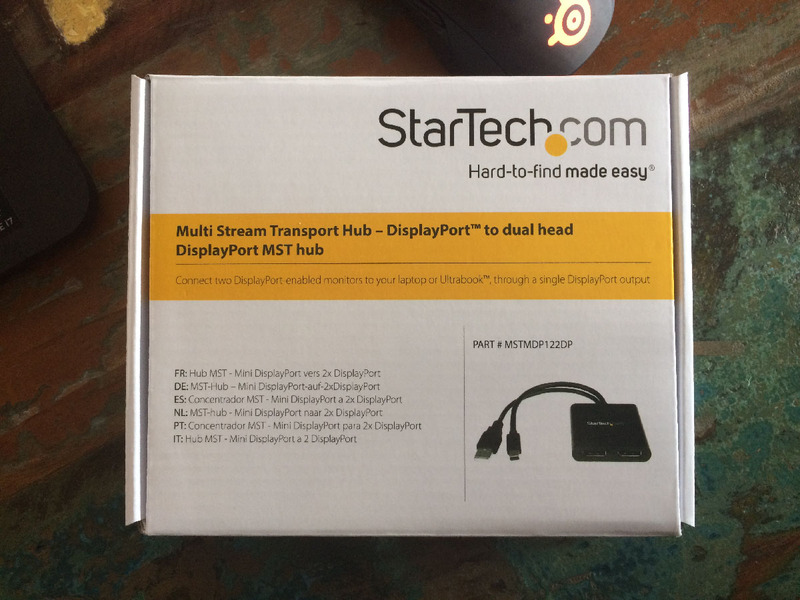 The StarTech mini DisplayPort MST hub is, at time of writing, available from StarTech for about £94. While I’ve yet to test one, the USB Type-C alternate should work with a Razer Blade and similarly troublesome laptops without the need for a dock or Thunderbolt 3 to DisplayPort adaptor. This entry was posted on Sunday, May 14th, 2017 and is filed under Personal Computing.